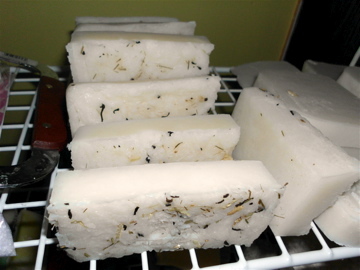 I sprinkled just a bit of chai tea on the soap to keep up with the rustic look that HP gives you. 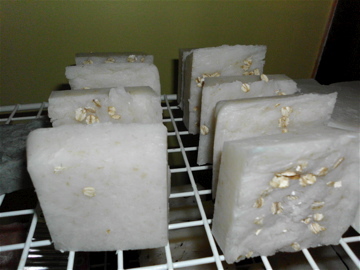 This one has loofa embedded into the soap and just a bit of oatmeal again for a more rustic look. I can’t wait for the discolor to come through. It’s almost like magic every time it happens. They look great! I am curious to know, do you hot process in a crockpot, and then put the soap in a large mold, or a loaf mold? Or do you hot process in the oven, with the soap in the mold? I’m wondering because whenever I hot process in the crockpot or oven, and then put the soap into any kind of mold, it just seems too thick, and really hard to get the air bubbles out, and smooth on the top! Thanks! I use a crockpot. I find people tend to cook it too long then it get’s too thick. I heat it on high until it folds over once, then turn it to low until it turns in itself again… Stirring occasionally. After that point I check for zap. If it’s good I put it in a Pyrex container and let it cool until under my fragrance flash point then add in fragrance, color if I choose, then pour into the mold. All in all it takes me just under an hour. Thanks so much for your response! I have definitely been cooking my soap way too long when I have used my crockpot! I am going to try your method, it sounds so much easier than how I have done it, plus way less fragrance than straight cold process! If you get zap after it’s folded into itself twice stir and cook for another 10 min or so then check again. When it’s done it’s usually like instant mashed potatoes. Let me know how it goes!